The process of publishing updated resident directories is underway! 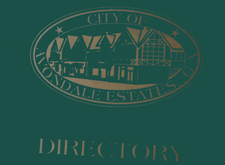 Directories include names, addresses and phone numbers of Avondale Estates residents and businesses. Updated directories will be mailed to each household in mid-June 2016. Directory forms requesting resident information can be found in the upcoming March/April Newsletter that will be delivered the week of February 29. Also, you can find a PDF copy of the form on the City website. Compelted forms can be hand delivered or mailed to City Hall, 21 North Avondale Plaza, faxed to 404-299-8137 or emailed to Gina Hill at ghill@avondaleestates.org. The City encourages all residents to please fill out the form and return it to City Hall, even if your information has not changed or you choose not to be listed in the directory by Friday, April 1, 2016.